To start recording, editing and producing your own podcasts that sound as good as the professionals you need just a few key items of equipment in addition to your Mac or Windows computer. We've put together a package that gives you everything you need at a great price, with a £100 saving on the individual items. The MXL 990 is a firm favourite with Podcast Authors all over the world, for it's clear and rich sound when capturing the human voice. It's a condensor mic, which means it is highly sensitive, quiet and captures all the subtle nuances of your voice. The MicroBook IIc is an audio interface from MOTU, Inc. , whose audio products are used by music professionals everywhere. This key connects to your computer via USB and provides several audio inputs and outputs, including the all-important connection to your microphone with the 48-volt "phantom power" it requires. 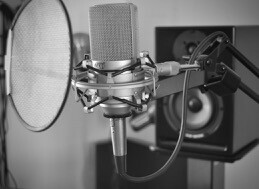 A Pop Filter is a very simple piece of equipment that provides a vital function, by stopping the "plosives" - the noise we make when we make a "p" or "b" sound - from reaching the sensitive microphone and causing it to overload. This smart and flexible microphone stand mounts securely onto your desk and allows you to adjust the microphone placement to it's optimum position so that you are comfortable whilst speaking while still capturing a good signal with the mic. The stand also incorporates a microphone cable, keeping it nicely tucked away. These comfortable headphones plug directy into the MicroBook IIc and allow you to accuretely monitor your recordings. AudioDesk is a powerful piece of audio recording, mixing and editing software that comes with the MicroBook IIc interface. It is based on MOTU's Digital Performer audio production software, used by Oscar-winning composers, among others. With AudioDesk you can edit your podcast and export the finished result ready for upload to the web.